How Old Is My Spode? It's very hot. In England we feel the need to talk about the weather... a lot. Two weeks in a row of wall-to-wall sunshine is the topic of conversation. For anyone wilting in the heat think of ices. 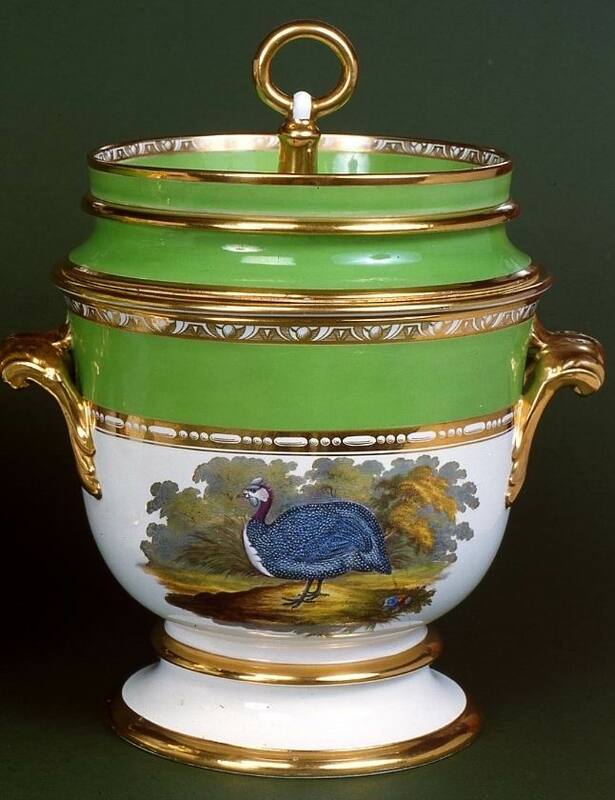 Here is a superb Spode ice pail decorated in pattern number 2114 which was introduced in about 1814. 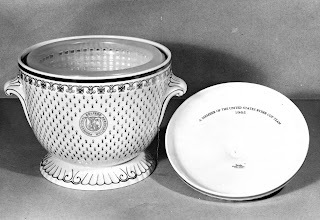 The ice pail is recorded in a Spode Shape Book of 1820. Sometimes called a glacier, or ice cream tureen, Spode called them 'icepails'. 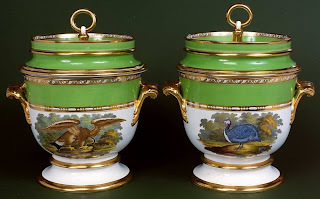 According to the Shorter Oxford dictionary on Historical Principles ice pail can also mean a vessel for holding ice for cooling wine and Spode also made wine coolers but called them, well, wine coolers! 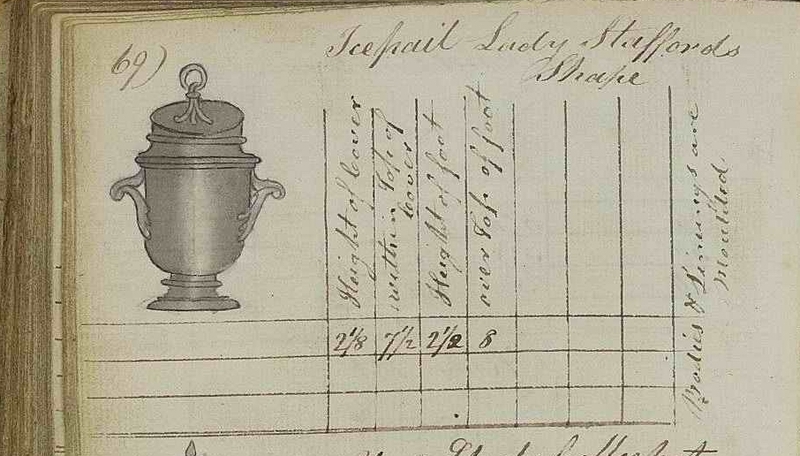 If you click Spode Exhibition Online it should take you to the results for a search on 'shape'. Select the Shape Book Index then look down the page for Ice Pails and Wine Coolers. Enjoy exploring. For comparison look at the Gadroon Wine Cooler entered on page 143. 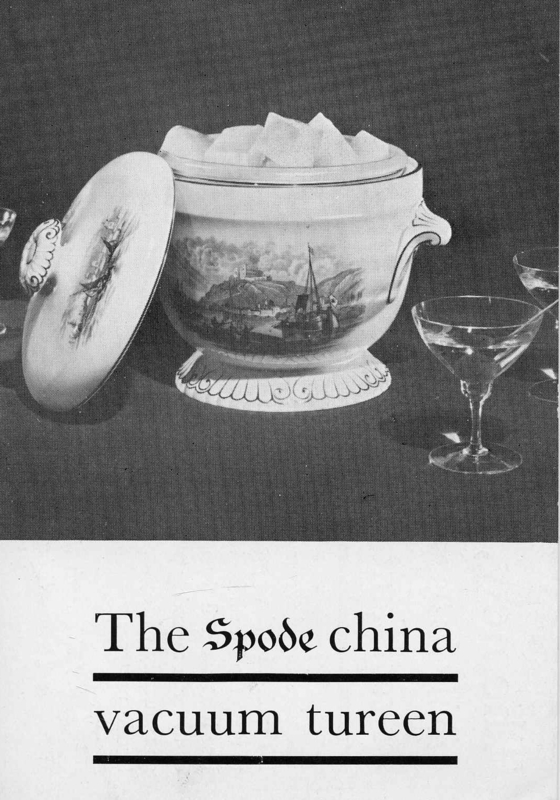 But back to Spode's 'icepails'. Here is the detail from page 69 and I suddenly realised how interesting the making details were. The Shape Book was a technical book. It has a hand painted illustration of the piece, the name of it, the sizes it will be made in and then thrower's measurements on the left-hand page and turner's on the right-hand page. But I spotted some writing at right angles to the main entry. It indicates that, of this 3 part piece, only the cover is made by throwing so the only measurements given are for this. The note tells us that the 'body' ie the largest part with the handles, is press moulded, as is the middle part (not really visible - see illustration of pattern 1559 below) which sits between cover and body. You can just see this very icepail by clicking Spode & the Movies for one of my blogs. Once on that blog page down for a still from a 1935 film showing a rather blurry image of Ronald and Gresham Copeland displaying the icepail's 3 parts. 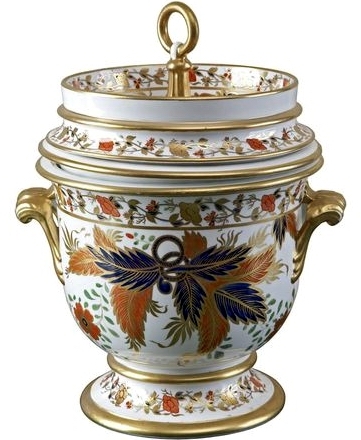 Ice pails were usually part of a magnificent dessert service comprising many pieces. It could be hundreds. Pattern 2114 is fully handpainted and gilded. Every single piece has a different 'bird in a landscape' painted on it. In the case of the ice pail, a different bird is painted on each side of each ice pail. Sometimes a pair would be supplied with the service so 4 different 'birds in landscapes'. 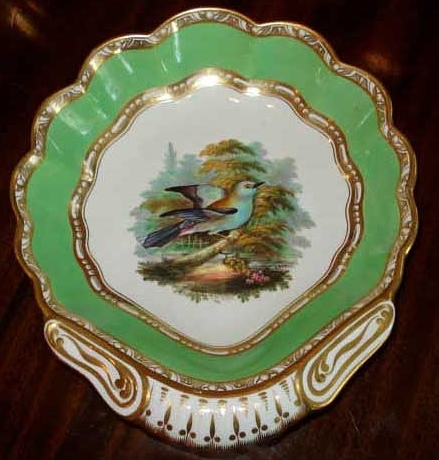 The green border and the elegant gilding tied the whole of this Regency design together. This service was perhaps for a wealthy customer with an ornithological interest; similar designs with botanical subjects could be supplied to those with a different interest. How did they work? The base or body which is the largest part held ice and salt; the round-bottomed middle, or liner/lining, slotted into the body and held the iced dessert for example ice cream. The cover fitted onto the liner/lining. The cover also had a depth to it and more ice could be packed into this if necessary. Ice at this period could be dirty as it contained straw and other detritus from being stored in an icehouse. Later in the century ice was imported from North America. This was crystal clear, clean ice and could be displayed in a crystal glass ice pail and the ceramic ones eventually went out of fashion. The ice pails here are bone china but Spode also made earthenware ones too. These were clearly items for customers of great wealth. 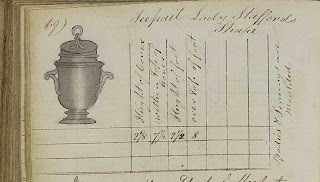 Not only could they afford the expensive Spode service they could afford the staff to perform the labour of producing ice, collecting it and storing it; and for making the ice cream by hand - no fridge, no freezer and no ice cream machine! The name of the design of the ice pail here may have been a tribute to the local aristocracy; a bit of marketing maybe! Lord & Lady Stafford's estate was (and still is) Swynnerton Hall about 12 miles from the Spode factory in Stoke so perhaps they were customers in the early 1800s. 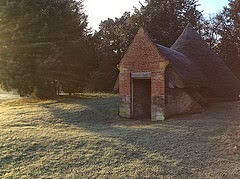 If you would like to see an ice house then go to the blog Compton Verney Grounds and the post entitled 'Historic features in the grounds - Ice House'. And if you want to know more about icehouses try the Shire Album Icehouses by Tim Buxbaum. If you want to know the most in-depth history of ice desserts then consult Elizabeth David's Harvest of the Cold Months - the Social History of Ice and Ices. And if you want to explore more of Spode's dessert wares use that link to Spode Exhibition Online above. In 1999 Pim Reinders wrote a book called Licks, Sticks & Bricks - a World History of Ice Cream for Unilever. The Spode Museum supplied images for it but it has so much more and is one of the cleverest designs for a book I have ever seen, both inside and out. Google it and you will find it on Amazon....be warned it is also one of the heaviest books I have ever come across too. Please visit my page The Spode Archive for full information on how to find out about your Spode and Copeland pieces and any Spode research you may wish to undertake. How Many Visitors to Spode History? Review/details of this book by Peter Roden are on blog 4 Mar 2011. Buy it? Wood Broughton Publications, 1 Wood Broughton Barn, Cartmel, Grange-over-Sands, LA11 7SJ. Price £25 [+p&p (£4.50 UK p&p)].